Honor and integrity define personal excellence. Vohra’s Code of Integrity reminds us that integrity is as vital as it is difficult. Honor Your Passions and Principles. You have a duty to yourself. The hardest and most important aspect of integrity involves duty to the self. Vohra students are expected to honor themselves and their own individual principles. This includes a duty to pursue interests, passions, and principles with or without external approval or incentive. As a simple example: if you want to be a writer, you must write. Failure to do so means squandering your sacred life, passion, and intelligence. Even if no one else wants you to be a writer, or thinks that you can't be a writer, you still must write! In other words: you don’t need someone else’s approval to be great. You don’t need a grant, a degree, an award, or a pat on the head to pursue what you want. You just need to honor yourself. Failure to honor oneself has sadly become commonplace. Many college “educated” students have become so dependent on approval that they cannot pursue anything without it. When they fail to pursue an interest because they don’t have external force, they dishonor themselves and squander their lives. Honor Your Body and Mind. You must never act to destroy yourself. Vohra students must avoid debasing themselves. Self-debasement may include drug or alcohol use, promiscuity, or other destructive behaviors. America has no shortage of students who throw away a lifetime of education through a few months of drug abuse. Vohra recognizes that avoiding self-debasement is more important than even math or science! At Vohra, we are intensely serious about preventing these destructive behaviors. Our students must put down a $500 deposit against drinking or drug use. If they are caught dishonoring themselves through these destructive behaviors, the deposit is forfeited. In order to re-enroll at Vohra after that, the student must put down a deposit of $5,000. This deposit increases by a factor of ten with every infraction. Many schools ignore the blatant disregard for personal health among their students. At Vohra, we’ve developed a system that works. Do not steal, lie, or cheat, except if required by the first two tiers. 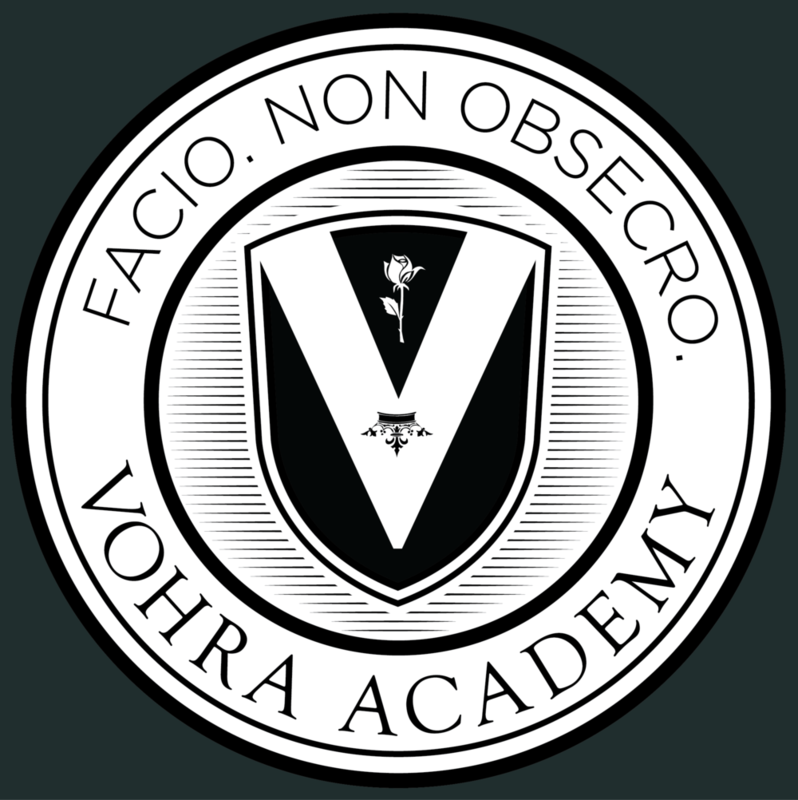 The third tier of the Vohra Code of Integrity is similar to the honor codes found at most elite academies. While important, it is considered subordinate to the first two tiers. At Vohra, academic dishonesty is basically impossible. Since you do everything in class, closely monitored, it would be impractical to attempt to plagiarize. Our only tests are third party tests like the SAT, which have their own security, so there is no practical way to cheat on a test. Besides, it would be hard for a Vohra student to find someone worth cheating off of! It is important to recognize and respect the society in which you live only as long as it is respecting you. On the Vohra coat of arms you can see a white rose. This symbol is an homage to the White Rose group who resisted the Nazi regime in Germany. In addition to breaking laws, they lied about their identities. However, doing so was the right thing to do. Telling the truth would have been counterproductive. When faced with a repulsive and cruel society, the duty to be honest and fair went out the window, and we believe that is as it should be. Honesty is a powerful expression of the self. However, foolish honesty simply makes it easier for the abusers of power to take advantage of you. As a simple example: Vohra students don’t tell colleges they attended Vohra. Why? If they did, colleges would treat them unfairly. However, if colleges changed their policies, or if regulatory agencies stopped requiring college degrees, then total honesty would make sense.